The forefather of the mighty Tyrannosaurus rex was discovered during work which was carried out in 2005. The 160 million year-old fossil found by the team was the oldest tyrannosaur found to date. The researchers were surprised to learn that the three metre-long dinosaur sported a spectacular crest on its head which may have been brightly coloured. It was thought that the discovery, which was unveiled in the journal Nature, may have been able to reveal how early tyrannosaurs evolved into the T rex of 100 million years later. The new species was found in the Junggar Basin, an area which had been discovered to be rich in dinosaur fossils, located in the far north-western corner of China. A local labourer who had been hired to search for ancient bones happened upon two dinosaur skeletons: a twelve year-old adult and a six-year-old juvenile. Both were found to be remarkably intact. 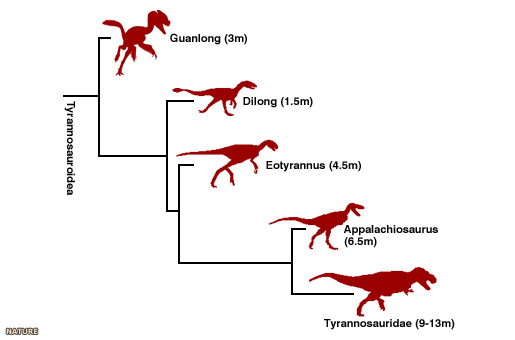 The international team which took on the work of extracting and identifying the fossils named the dinosaur, which hails from the Late Jurassic period, Guanlong wucaii, which was derived from the Chinese for 'crowned dragon'. Professor James Clark, an author on the paper and a palaeontologist at George Washington University, US, described the discovery: 'We found two skeletons of a therapod dinosaur. When we looked at them very closely we found that they were a relative of Tyrannosaurus rex, making them the most primitive tyrannosaur relatives that we have seen. 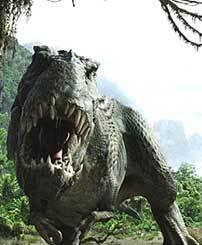 Tyrannosaurs were the dominant group of predators during the Late Cretaceous period. This era, between about 65 to 100 million years ago, marked the final chapter of dinosaur dominance before the great extinction of 65 million years ago. It was during this time that T rex roamed. The most famed member of the tyrannosaur family; its immense size of nine to thirteen metres, huge teeth, and tiny but savagely clawed forearms have made it the beast of choice for many Hollywood films. Professor Clark described how G wucaii would have looked: 'The most obvious thing was that it had a big crest in the middle of its head. For carnivorous dinosaurs that's pretty unusual. We suspect that the crest was highly coloured and probably a display structure of some kind.' He added that it shared some features with the later tyrannosaurs, such as T rex. It had sharp teeth, similar muscle scars on its hips, and probably ran on two legs. But G wucaii differed markedly in terms of its size: at three metres it was much smaller. In addition, its more primitive skull and pelvic features would suggest that that it was an intermediate animal between tyrannosaurs and the coelurosaurs - an even older, related group of dinosaurs which are thought to be the predecessors of modern birds. The researchers hoped that the find would reveal more about the primitive phase of tyrannosaur evolution. It showed how the small coelurosaurian ancestors of tyrannosaurs took the first step that led to the giant T rex almost 100 million years later. Most of the tyrannosaur fossils that had so far been found dated to the latter years of tyrannosaur existence, and there were very few early specimens available. 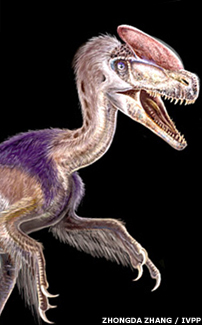 Prior to the discovery of G wucaii, the 130 million year-old feathered Dilong paradoxus which was reported in 2004 was the oldest tyrannosaur known. Dr Paul Barrett, a palaeontologist at the Natural History Museum, stated that the discovery of this new animal pushed the origin of the group containing T rex further back in time and also showed that early tyrannosaurs had a much wider distribution than previously thought. The researchers believed that G wucaii, with its bizarre crest, would begin to fill in some of the gaps of our knowledge of tyrannosaurs. There were almost 100 million years of fossil record between this sample at 160 million years ago and T rex at 65 million years ago, and only a few tyrannosaurs were known between those two extremes. The message seems to have been that researchers were only just getting started when it came to finding the missing records of these early tyrannosaurs.